Leah Golberstein identifies herself as an observant Jew. She regularly studies the Talmud. She is also very familiar with Jewish history, and deeply aware of the oppression that Jews have suffered at the hands of Christians and Muslims. But on a recent visit to the Greek islands of Rhodes and Crete, Golberstein found herself entranced by religious symbols that were not her own. "One day I did nothing but visit magnificent churches and then I went to the museum of Byzantine culture," says Golberstein. "I found myself standing in front of this tryptich and there were tears streaming down my eyes and I was not expecting to have this reaction at all. And that sort of reframed the whole trip for me." Golberstein says she discovered she identified with the depth of devotion she found in the art of other religious traditions. She saw beauty not just in the old Jewish quarters, but in churches, a medieval mosque, a Turkish cemetery and old fortress walls. She started collecting fragments of bark and twigs lying on the ground in these ancient places. And when she came home she started making sculptures that drew on what she learned about herself, and what the religions share. 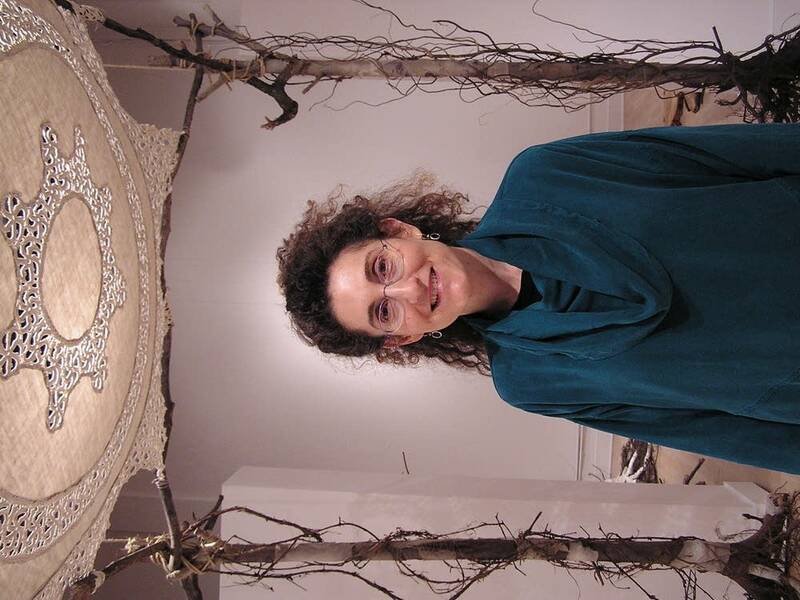 She made rosaries out of dried flowers, and used uprooted dead trees to represent people displaced by tragedy. 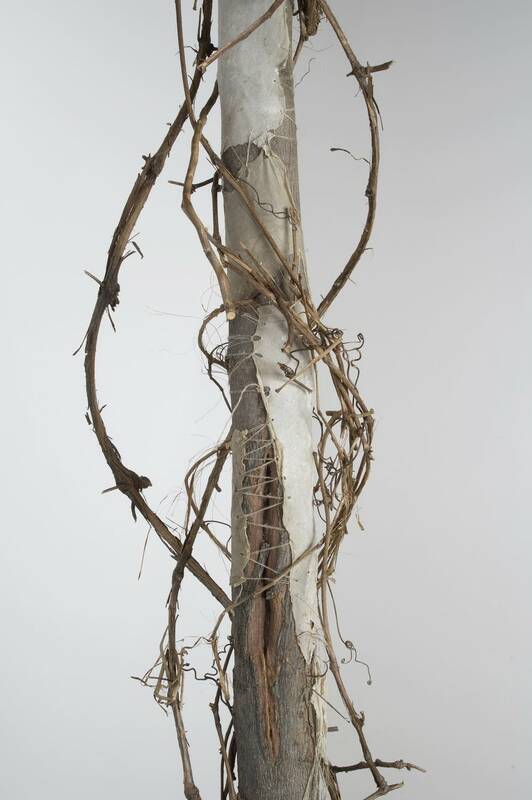 "Trees bear witness to the social and political changes over time and over generations and so I dug up trees and have wrapped them and sewn handmade paper around them as my way of bandaging and trying to heal some of the physical and emotional psychological pain of those whom the trees represent," says Golberstein. 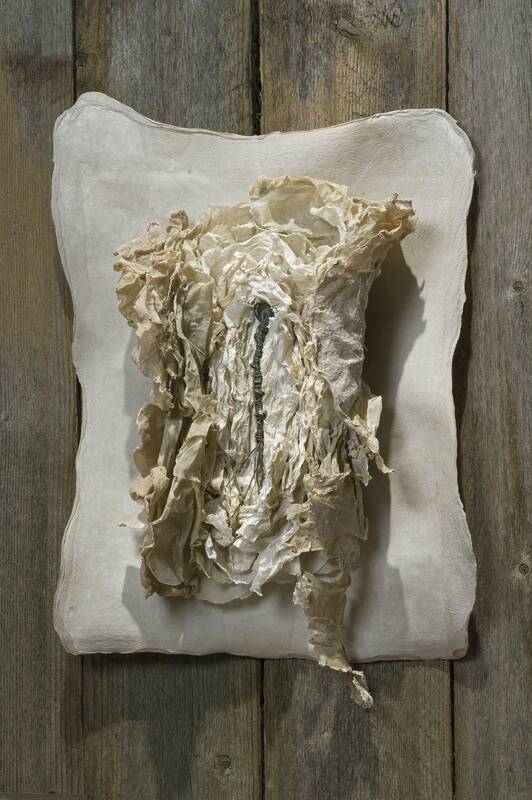 Uprooted Lights includes a series of works that weave together handmade paper with rosaries or a Jewish prayer shawl. 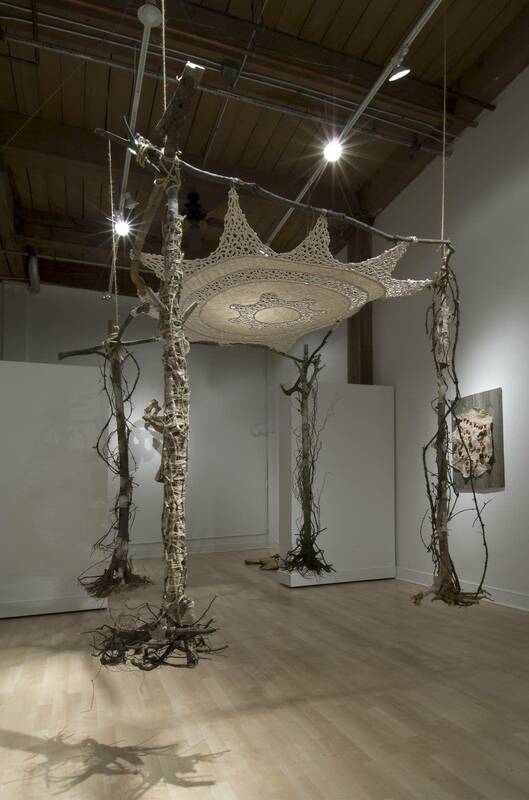 At the center of Golberstein's exhibition is a chuppa - a Jewish wedding canopy. It hangs from the ceiling, floating two feet off the ground, creating a sense of light and weightlessness. The four posts of the canopy are made from trees bandaged with paper and twigs and wrapped with old grapevines. The canopy itself is a crocheted tablecloth that Golberstein's grandmother made in Poland, possibly for her wedding trusseau. Joyce Lyon is an artist who also shows her work at the Form and Content gallery. She says when she saw Golberstein's exhibition she was struck by the subtle way it brings different cultural strands together. "She makes references to rosaries, she makes references to the Jewish prayer shawl," says Lyon. 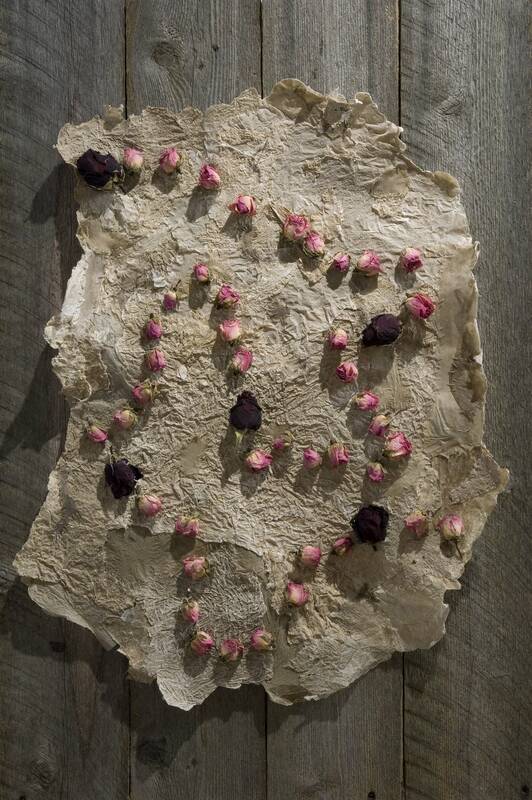 "But I think in using the handmade paper and in using the natural materials, what she's trying to do is to point out that there are commonalities, at the very root level." Uprooted Lights runs through December 13th at the Form and Content Gallery in Minneapolis. Golberstein says she chose the title because in the Jewish tradition people often speak of souls as lights or flames. "The essence of this exhibit for me is to be able to not judge," says Golberstein. "To be able to see the beauty in other places and things and religious objects and in art that is not our own and sometimes even which may have caused pain to our own." Leah Golberstein says her goal is to create a space in which people of various faith traditions can feel a sense of serenity.